The Yick Company was one of the earliest manufacturers of Chinese Wok Ranges in the United States. In 1910, Robert Yick Company developed a strong reputation throughout San Francisco’s Chinatown for its Yick Chinese Wok Ranges, one of the company’s specialties. Robert Yick Company makes durable custom Chinese Wok Ranges that deliver extremely high BTU output, the Wok Ranges and include features to prevent excess heat radiation and buildup. Constant, hard use of Wok Ranges can cause deterioration unless extra-heavy materials are used. We make our Chinese Range tops from heavy, 10-gauge mild steel plate (black), or optional 12-gauge stainless steel double drum system. The outer steel drum wells are welded to the Range framework. All water lines are made of brass to avoid galvanic deterioration. The entire unit is designed for extra strength and durability. We provide water-cooling for kitchens that require heat sources to be controlled. Water-cooling systems use a front-to-back flow of cold water via a perforated copper pipe, which runs underneath the length of the stainless steel front ledge and provides water to the top surface. *An optional back-to-front cooling system is also available. The elimination of unnecessary lap joints and hard-to-reach crevices makes clean-up simple. The Range top is pitched steeply, so that waste easily flushes into the drain trough. For Ranges with two burners or less, a sump box is usually located at the rear corner of the Range top. 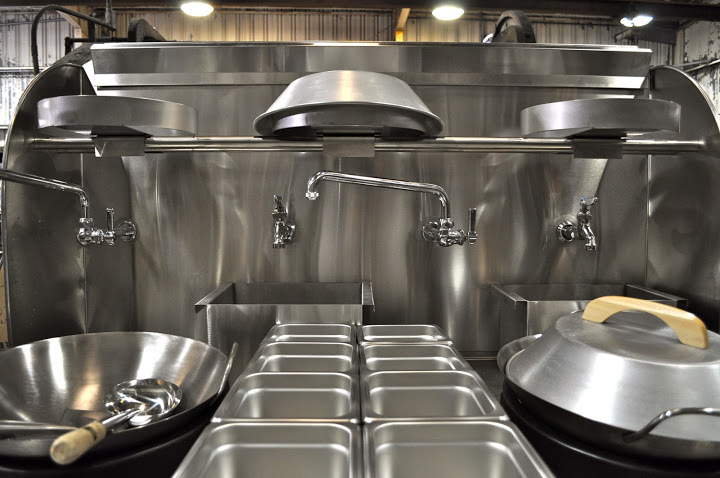 For Ranges with three burners or more, a larger sump box is usually located near the middle of the Range, with easy pullout access from the front-face of the Range.